A shooting at a Scarborough apartment building at Lawrence Avenue and Kingston Road was the 90th homicide of the year in Toronto, setting a new record. 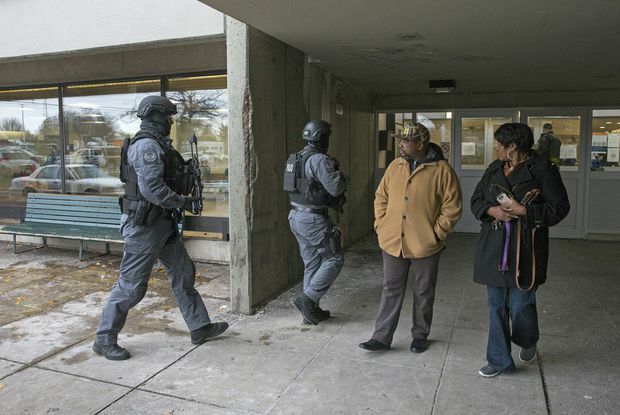 It took the deadliest year in the city’s history, but Toronto Police Chief Mark Saunders says he’s confident all levels of government are now listening. His comments Monday followed the city’s 90th homicide on Sunday – a fatal shooting in the city’s east end – eclipsing what had been 1991’s record. And while he stressed that means the vast majority of the city’s 2.8 million Torontonians are safe, he acknowledged the “brazenness” of some of these shootings has increased. Toronto homicide detectives are investigating the Sunday shooting death. Police received the initial call for the sound of gunshots at around 1:23 p.m. Despite the call for the sound of shots, there was no other commotion reported in the apartment building at Lawrence Avenue and Kingston Road. “Officers happened to be fairly close by, and they were able to respond to this very quickly,” said Constable David Hopkinson, a Toronto police spokesperson. Searching the building, officers soon found a 23-year-old man without vital signs, along with some shell casings. Paramedics were rushed to the scene. Shortly afterwards, the victim, Cardinal Licorish of Ajax, Ont., was pronounced dead. Homicide detectives have taken over the case. Of the homicides so far this year, shootings make up over half, claiming 47 lives. There have been 19 stabbing deaths, and 24 deaths that are classified as “other," including the 10 people killed during April’s van attack. Plans to reduce gun violence became a heated subject of debate in the most recent municipal election, won by incumbent Mayor John Tory. Speaking at a press conference at city hall on Monday, Mr. Tory said he would not accept the record homicide tally as a “new normal” for Toronto. He reiterated his moves to seek new federal funding for programs for families and youth and to provide police with added resources. He also said that as the city begins to prepare its 2019 budget, he would take a look at the city’s own youth equity strategy, which critics have said is underfunded. “I think what we have to do is double and triple and quadruple our resolve to try and address it as best we can,” Mr. Tory said. 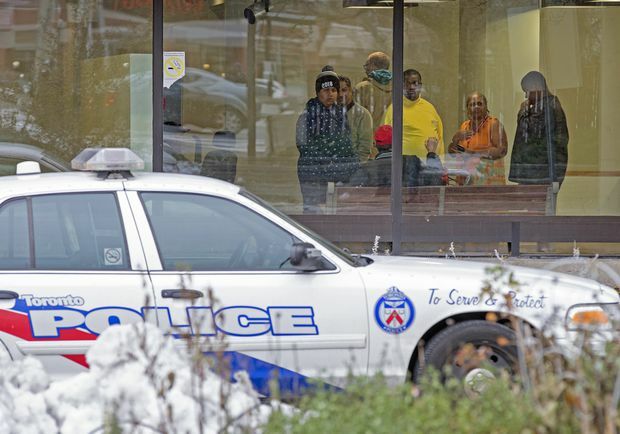 An unidentified man was found without vital signs after being shot in a Scarborough apartment building at Lawrence Avenue and Kingston Road on Nov. 18, 2018. That governments are now listening to the need for action on violence is crucial, Chief Saunders said, because the battle will take a collective effort. “It’s not just a policing solution,'” he said. In neighbouring Peel Region, Police Chief Jennifer Evans has blamed the ban on carding – the controversial police practice of collecting information about people they stop to question – for the rise in violence. The practice was banned after it was found to disproportionately target people of colour, but some police officers argue they have lost a necessary investigative tool. He said he could not say that the ban on carding was not a factor, but that it was important to look at the whole picture. He cited root causes of violence such as poverty, and lack of housing and job opportunities. He said there is a need for more core funding for community organizations. “Grant funding happens for a couple years and then it’s gone; you have to rebuild it. There has to be core funding to make it work, to make it sustainable,” he said.